Review: 2014-06-28, James Te Huna vs Nate Marquardt gets three stars thanks to a good finish (UFC Performance of the Night). James Te Huna entered this fight with a professional mma record of 16-7-0 (81% finishing rate) and he is ranked as the No.20 light heavyweight in the world, he fought three times in 2013 winning the first bout, against Ryan Jimmo (=Te Huna vs Jimmo) but then he lost twice: against Glover Teixeira (=Teixeira vs Te Huna) and Mauricio “Shogun” Rua (=Rua vs Te Huna). His opponent, the black belt in Bjj and Pancrase Pankration Nate Marquardt, has an official record of 32-13-2 (75% finishing rate) and he entered as the No.35 welterweight but he lost three out of three fights in 2013: against Tarec Saffiedine (losing the Strikeforce Ww title Marquardt vs Saffiedine), Jake Ellenberger (=Ellenberger vs Marquardt) and Hector Lombard (=Lombard vs Marquardt). 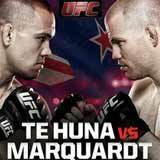 Te Huna vs Marquardt is the main event of UFC Fight Night Auckland – Ufn 43. Watch the video and rate this fight!